September 15th is known as International Dot Day because that's when the book, The Dot by Peter H. Reynolds, was published in 2003. This book is about a little girl named Vashti who does not believe that she can draw. With the help of her teacher, she realizes that she actually is an artist. This book invites students to explore their creativity by simply "making a mark and seeing where it takes them." 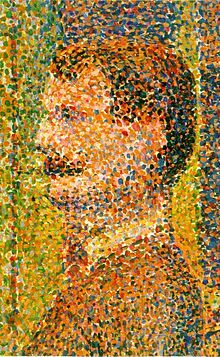 On Tuesday, we learned about pointillism and focused on the artwork of Georges Seurat. On Wednesday, we were able to livestream with the author of the book (and his twin brother, Paul). The students were SO excited about this. I invited our librarian and the other 5th grade class to join us and they enjoyed viewing the livestream as well. Peter read aloud the book, shared what inspires him, and had a brief discussion/Q&A time. There were so many questions that were submitted and we were thrilled when a question from our class was read aloud and answered first!! One of my students asked, "How did you come up with the character's name, Vashti?" We had wondered if he'd gotten it from the book of Esther in the Old Testament of the Bible. You know, Queen Vashti? Well, he didn't get the name from there, by the way. ;) If you'd like to view the archive (and learn how he actually came up with the character's name), CLICK HERE. It's about 30-40 minutes long. On Thursday, the students practiced pointillism in their art class (I had emailed the art teacher and she, of course, wanted the children to celebrate in her class as well). The students couldn't stop talking about the artwork they made. I can't wait to see it! On Friday, we had "dot" snacks, which were a hit! I provided chocolate chip cookies, Skittles, and Smarties. YUM! On Monday, each of my students will receive a certificate for their participation in Dot Day and, at the end of the year, these certificates will go in their time capsules (which I'll talk about in another post). How did your class celebrate dot day? Leave a comment or join the discussion on Twitter #DotDay. Also, be sure to follow the Peter Reynolds Twitter feed @DotClubConnect. I am so excited to discover your blog! I too teach 5th graders and we too celebrated International Dot Day. I found your blog via Pinterest and I'm having fun reading posts. You have shared several clever ideas I can use in my classroom. I bookmarked your blog so I can stop back. Thanks for sharing!